Climate change is one of the biggest risks affecting Brussels, potentially costing the city's economy €400 million a year, according to a new report by insurance giant Lloyd's. "This amount is expected to increase as extreme weather events become more frequent and violent," the report said. As the European capital continues to bask in 30°C heat, the Lloyd's City Risk Index looks at how Brussels and other major European cities are exposed to threats from flooding to cyber-attacks - and what can be done to prevent them. Among the climate-related risks that Brussels faces, flooding is the most serious and expensive, with a possible annual loss to business of €216 million. But droughts are also an issue. "Water management in the face of climate change should be a priority for urban planners," Lloyd's said. 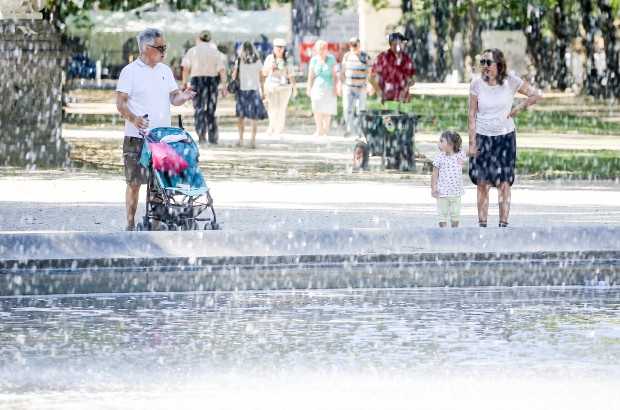 Brussels has no immediate plans to introduce water restrictions as the hot, dry spell continues. A Vivaqua spokeswoman said water consumption is already lower than usual over the summer, with residents on holiday and schools closed. East Flanders has eased its water restrictions. Farmers and gardeners can now use non-drinking water between 18.00 and 10.00. Watering sports fields is also now allowed. Other measures to limit non-essential use of water remain in force. Residents in East Flanders are asked not to wash their car, water their garden or fill swimming pools. "Basking" in 30°C heat? Don't think so.